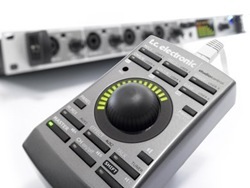 TC Electronic’s powerful FireWire interface konnekts most of the dots any studio professional would need to cover. In addition to the software mixer/control panel interface (see “In Use” section), the SK48 is endowed with an inclusive set of hardware I/O and control features that, for most users, will leave little to be desired. 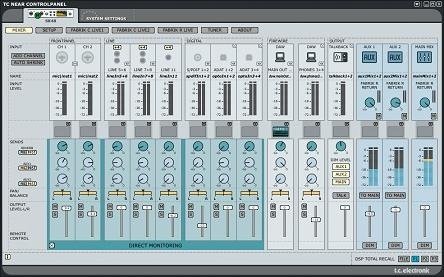 For those who do desire more: the “NEAR” in TC NEAR stands for Network Expandable Audio Recording, making it cross-expandable with rest of the Konnekt family. On the front panel are four mic/instrument inputs on Neutrik 1/4-inch (unbalanced)/XLR combo jacks, each with a corresponding gain trim pot and selectable -20dB pad. The TC “Impact II” preamplifiers provide a total of 62dB of gain for mic level (XLR) inputs and a variable 2000/1300-ohm impedance (pad on/off). THD and dynamic range at minimum gain is < -95dB (0.002-percent @ 1kHz, -1dBFS) and < -106dB (A-weighted, 20Hz – 20kHz) respectively; adjacent channel crosstalk is < -75dB (20Hz – 20kHz). A global phantom power switch provides +48V to sources connected to the XLRs. The 1/4-inch TS instrument inputs provide 42dB of gain and present a 1-Megohm load. Performance specs are essentially the same as the mic inputs, but with a 15dB improvement in crosstalk (-90dB). TC Electronic | 818-665-4900 | www.tcelectronic.com. Also on the front panel are two discretely addressable 1/4-inch headphone outputs (outputs 3/4 and 11/12) with individual volume controls and a digitally controlled analog output knob that, depending on configuration, can provide unified level control over up to eight analog outputs. A respectably large LED display provides six-segment input level metering of all 12 analog inputs (individual meters for channels 1 – 4 and 5 – 12 in pairs), as well as single LED signal status of ADAT, S/PDIF, TOSLINK (1/2, 3/4) and MIDI activity; a single LED confirms FireWire connectivity with the software driver. With that out of the way — and TC working hard to address these issues — it may sound odd to hear that I genuinely loved the Studio Konnekt 48. It was a masterful example of interface design, and the amount of professional-level options it presented was near-astounding (no pun…). The AD/DA conversion was top-notch, as were the four preamp inputs — I wouldn’t hesitate to use these inputs in place of dedicated preamps costing more per pair than the whole SK48 system.